The upcoming Misfit Vapor 2 is about to make its debut on the market, even though no official announcement was issued yet. We first reported about the smartwatch last week when several European retailers listed the successor of the Misfit Vapor on their online stores. Meanwhile, in the United States, Best Buy already has the Misfit Vapor 2 available for purchase, granted, just one of the four variants can be ordered at the moment. The other three appear as “sold out” which means that the retailer is in the process of getting stock. Misfit Vapor 2 is available for $250 at Best Buy and comes in two size versions: 41mm and 46mm. Each will be available in two colors – Black and Rose for the 41mm model, Stainless Steel and Jet Black for the 46mm model. The listing confirms a couple of important features like the built-in GPS, NFC (Near Field Communication) support, AMOLED touchscreen display, Wear OS and water resistance. There's no mention of the chipset, but the Misfit Vapor 2 will pack 512MB storage. Also, the smartwatch will be compatible with phones and tablets running Android 4.4 or late (excluding Go edition), as well as iOS 9.3 or later. 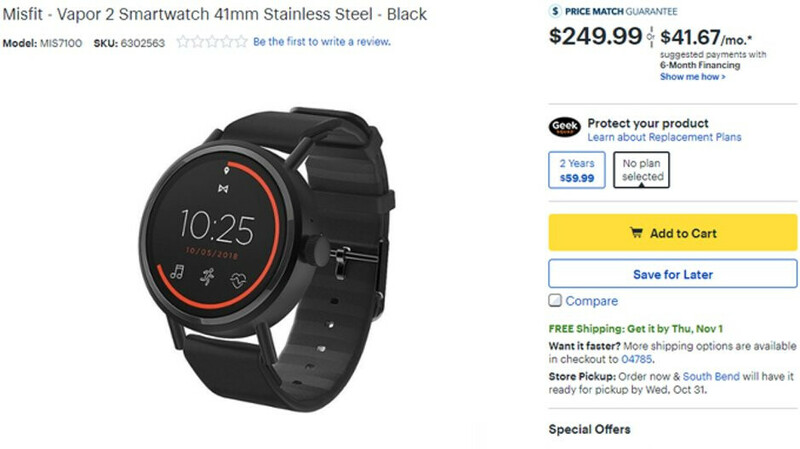 According to Best Buy, the Misfit Vapor 2 will hit the shelves on November 1. Good looking watch, and it looks like they're offering various sizes. Personally I like the bigger watches. I guess I'll hold out hope for the SoC 3100.